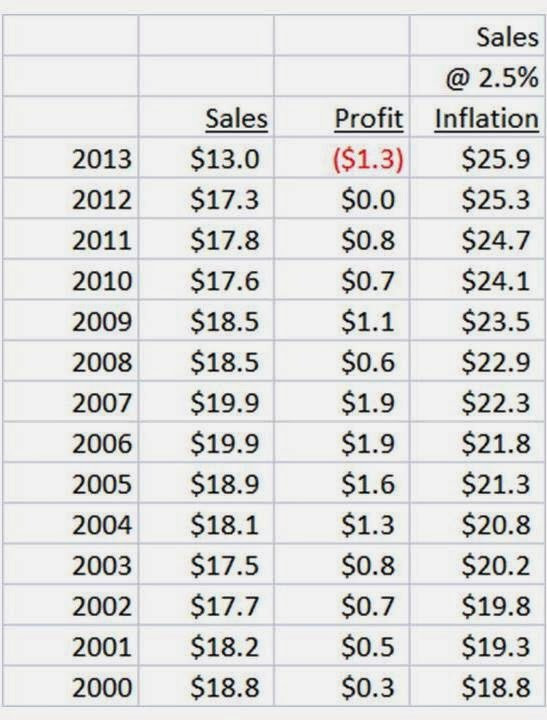 Here's a ten year view of total net sales, operating profit, and sales if they increased at a 2.5% inflationary rate. What do you see (figures in billions)? When compared against a reasonable inflation rate, sales have been cut in half in a thirteen year span, have they not? Heck, sales need to increase by 33% next year just to get back to 2012 levels. And when that is accomplished, they sales need to increase by another 46% to catch up to modest levels of inflation. In Q4-2013, same store sales rose 2%. In other words, the hardest part of the turnaround is not complete. When I worked at Eddie Bauer (late 90s) and Nordstrom (00s), we liked to see sales per square foot, in stores, at about $300 per year. JCP is just north of $100. #omnichannel. From 2007 to 2011, their business shrunk by 11%, with operating profit shrinking by 58%. This was not a healthy business before the experiment to move away from discounting. There are very few mentions of merchandise in the article, and maybe that's to be expected in an article in a trade journal focused on advertising. Is it possible that large format retail stores have too much square footage to support existing demand? What does it mean if the answer to the question is "yes"? It has been a decade since customers wanted to buy merchandise at increasing rates at JCP. Discounting has been consistent during this time. The online channel has been consistent and present during this time, suggesting that merchandise might be a problem. How would you fix the merchandising issue at JCP? Pursuant to the merchandising issue at JCP, how is it that Kohl's grew from $10.3 billion to $19.3 billion in a decade while JCP shrunk by $4 billion during the same timeframe? Discuss the reasons why this would happen. What are your thoughts about traditional department store retail brands and their relationship with middle income customers across various age groups? In other words, describe the future of #omnichannel, when some retailers thrive and others struggle. Go! Denver - Afternoon of March 10? I may have a few hours of free time the afternoon of March 10 - in Denver. If you're in the Denver area, and want to meet, contact me immediately (kevinh@minethatdata.com) - these sessions fill up quickly! Take a look at this image ... see if you can count how many sale signs appear just in this one image. Yes, you're right, there's more than twenty (20) red sale signs in this one image alone. Imagine being part of the visual merchandising team ... the #omnichannel color palette includes, well, um, uh, Red! Think of the size of the audience that prefers merchandise within a Sears store. 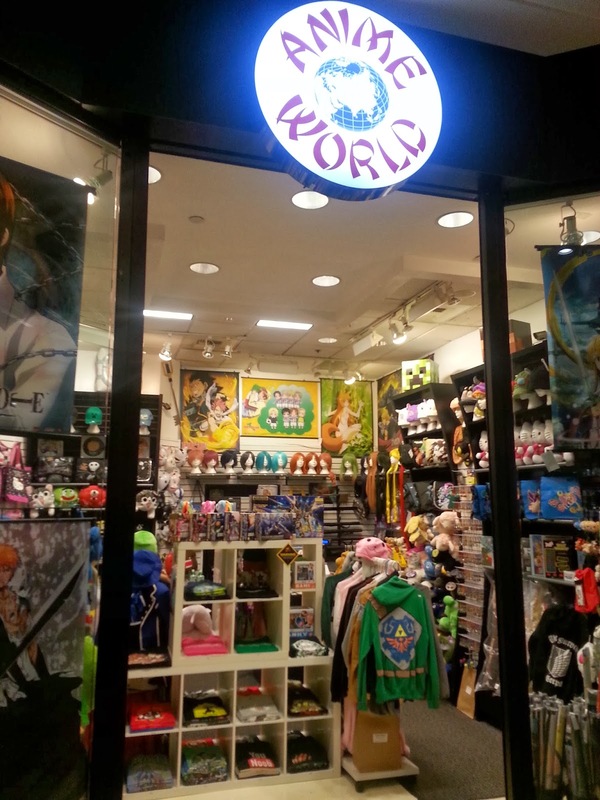 Think of the size of the audience that prefers merchandise within an Anime World store. Obviously, discounting is not required to draw a profitable audience, is it? Think of the #omnichannel message you're sending to the customer ... what do 20+ red signs in a narrow field of vision communicate? Let's say you are an email marketer. You send five email campaigns a week to customers who love to "engage" with "relevant" content. If you do your job well, you cause an unanticipated by-product. You cause your customers to use search to compare your merchandise to what other folks offer. When this happens, you must incorporate the cost of paid search in your email (and catalog) circulation decisions. Here's an example. You're running email mail/holdout tests, right? Right?! Take a look at the difference between the mail group and the holdout group, when it comes to paid search. Mail Group = $1.00 spent on paid search. Holdout Group = $0.80 spent on paid search. This tells us that 20% of paid search expense (I know, it's more complicated than this, and there are new customers using paid search, but come one, follow along for a moment) is caused, yes, caused by email. Take email away, and you eliminate the habit of the customer going out to search for competing merchandise. Here's where things get interesting. 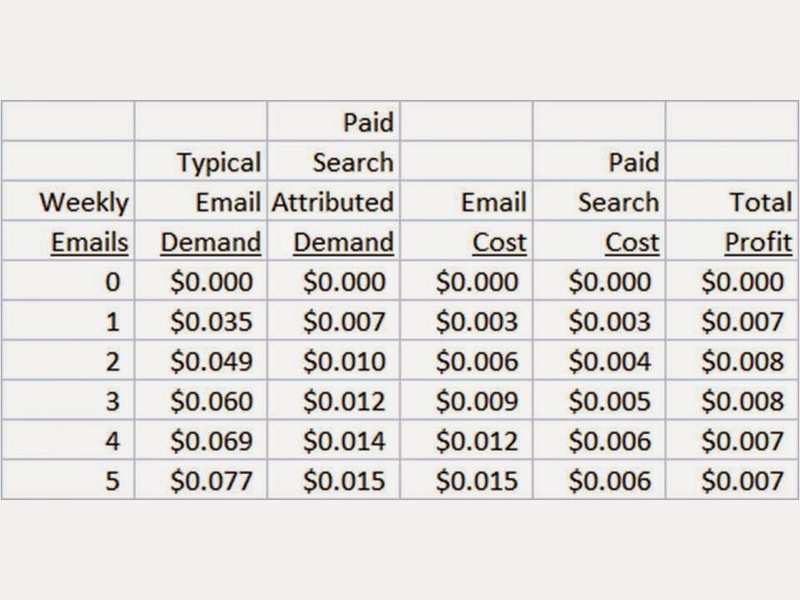 In the real world, you must allocate the $0.20 of paid search demand back to your email marketing program. And, you must allocate the expense associated with paid search back to your email marketing program as well. Now, across the top 20% of the email subscriber list, this has no impact whatsoever. But among the 80% of the email subscriber list that spends almost nothing? Here, paid search expense results in two or three email contacts per week, not five. I know, you're saying, "the difference in profit is irrelevant". But if you're a hundred million dollar business, then this results in several hundred thousand dollars of profit a year. Email me your question (kevinh@minethatdata.com) for an upcoming Monday Mailbag! "You mentioned that customers who joined a community at "Brand X" spend eight times as much as other customers. And yet, Mr. Hillstrom shared earlier that when you measure the incremental value of any marketing tactic, like joining a community or joining a loyalty program, customer value seldom increases by more than 10%. How do you explain the difference in measurement philosophy and outcome? Who is right?" I love it when we statisticians use methods that appear to satisfy all necessary assumptions, and yet, result in highly biased analytical results. I only know this because I made mistakes for eons before I figured out just how wrong I was. And having said that, I don't have a right answer. I just know that the best practice is wrong. When measuring the value of an activity, researchers typically execute measurement techniques with varying levels of bias. High Bias = Compare those who are part of a group or marketing tactic against those who are not. Terribly biased. This would be like measuring the political beliefs of those who call in to Rush Limbaugh's radio show, comparing them against everybody else. This is the methodology that is used 90% of the time. Moderate Bias = Compare those who join a program at the time they join the program vs. those who are equal at that time and do not join a program. This is the method that is used by smart researchers (like the individual who was presenting at the conference). You equalize all customers, then you measure the "self-selected" activity against all other customers. This method is very good. It is also biased. There is something about the customer who self-selects for a community or a loyalty program or whatever that is not accurately measured by the fact that the customer self-selects. When using this style of measurement, we always show a positive outcome - always, and often, a highly positive outcome. I have yet to see this method applied and result in a negative outcome. Are we suggesting that we, as marketers, never make mistakes, and never do anything that doesn't deliver a sales increase? The measurement tactic is biased because we don't accurately capture the motivations behind why a customer joins a community or a loyalty program, and as a result, we over-state the importance of the behavior. Low Bias = My method (hopefully, maybe I'm wrong, too). My method is still biased, but I've removed much of the friction. I don't analyze customers at the exact point in time when they do something, I freeze/segment customers at a later point in time, then compare the customer against similar customers who are not in a program. Let's say that we start a community program or a loyalty program on July 1, 2013. I will freeze my file as of January 1, 2014 - and create a segmentation variable for the customers who joined the program during 2013 - along with other RFM-centric variables as of 1/1/2014. Then, these variables are entered into a model, measuring spend during January 2014. This method usually shows that the incremental value of any marketing program is in the 10% range, maybe lower. Yes, there's a million biases here, but you avoid the self-selection bias that occurs in the other two methodologies. Now, let's be perfectly honest - the person at the session did a great job of reducing bias in his analysis - at least 90% of the work I see out there doesn't go as far as this individual did. He tried very hard to eliminate bias. Very hard. Here's our challenge, folks. With the high-bias and moderate-bias methodologies, we will always show that any marketing activity - any activity - has a positive return on investment, and frequently, a grossly overstated return on investment. The outcome does not pass the smell test ... if all these programs worked, then all companies would use the programs and all companies would show sales gains that are +20% or +50% per year. That's how we know that the methods are biased. Let's pretend you are a small retailer, serving a 45 - 55 year old customer. You own five stores, and you have a strong e-commerce presence. You have two strong stores, you have two weak stores. Your online business is growing by 15% to 20% per year. But as the online channel grows, the weaker stores continue to get weaker. Let's project this business out, from 2014 - 2020. Do you see what happens, folks? In just three years, the productivity drops cause the fifth store to be unprofitable. In six years, the productivity drops cause both the fourth and fifth stores to be unprofitable. Meanwhile, the online channel grows and grows and grows, fueled by mobile. Between now and 2020, your CFO runs the projections. She sees the writing on the wall. Strong stores will get even stronger. Weak stores have no purpose in a mobile world. They become unprofitable. By 2017, your CFO has convinced the Executive Team that Store #4 and Store #5 need to be closed when the leases run out at the end of 2020. 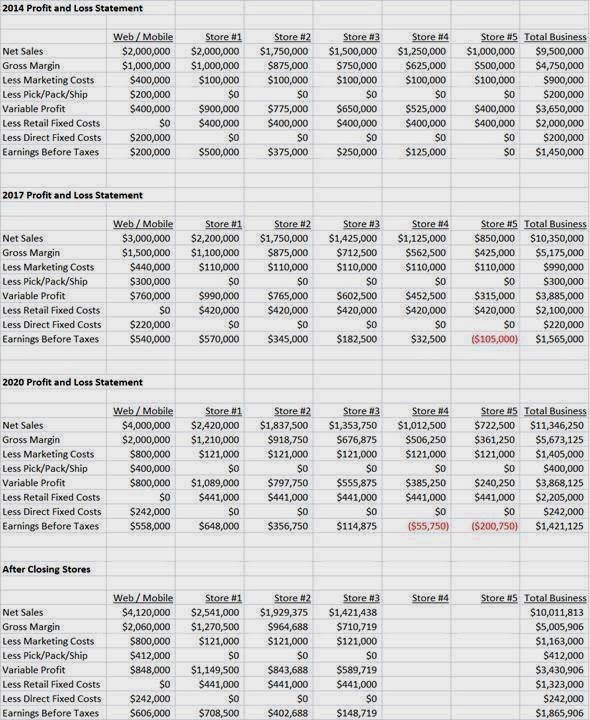 The projected profit and loss statement in 2020, with stores closed, looks very healthy. But the business has cut back on total stores by 40%. This is how structural change in retail plays out. It's not a big, dramatic "end-of-the-world" scenario, it's not doom. And it's not the success promised by the omnichannel community. It's a slow evolution that eventually achieves critical mass, resulting in the closing of what have become unproductive stores. In other words, the retailer without debt and with 10% - 15%+ pre-tax margins survives. Easily. 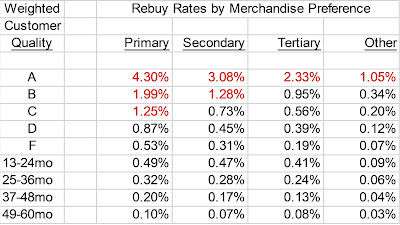 The outcome is worse for 5% pre-tax retailers. This whole thing plays out the same way it did for catalogers from 2003 - 2013. The only problem is that paper can simply disappear from the ecosystem. Dying stores will turn into dying shopping centers. What comes next? That's the really interesting question. You almost have to believe that the stores that survive will become far more entertainment/service/emotionally based. They will have to become that to compete with the cold, sterile omnichannel solutions being thrust at us by technology. They will have to fuse, in some way, with mobile ... a mobile channel that will likely be in the process of thoroughly consuming e-commerce by 2020. The stores that die will sit vacant, or will be replaced by something that folks currently age 8-34 will embrace. That's going to be very interesting to watch unfold. 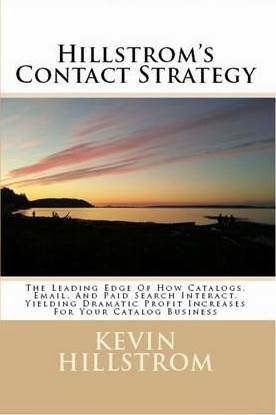 Back in 2005, my company, Nordstrom, decided to eliminate the catalog business model from their arsenal. The pundits really, really didn't like that decision. Trade journalists called me - I recall being heckled on the phone by folks who hated the decision but loved the page views it would generate ... "you're so stupid, catalogs are part of a multichannel strategy, you'll be back in catalogs in twelve months, you have to have catalogs, don't you know that?". Nordstrom never looked back. For the past decade, they've printed money. And don't call what they do now "catalogs". Those are magazines. Be honest. 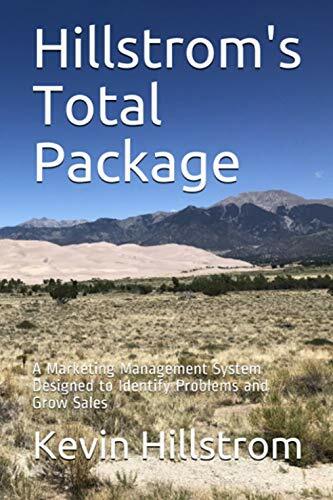 A catalog business model includes catalogs as the primary marketing vehicle on an every-three-week basis paid for by company money (not co-op dollars), along with the buying and selling of names/addresses. That business model left the building in 2005, and never came back. Channels are not channels. Channels are the manifestation of changes in customer behavior. Yes, I plugged results for 2019 (in green). What do you see, when you look at total demand, adjusted for inflation? You see that total demand is unchanged, over time. Customers slowly move from mail to phone to online to mobile over time (and will move to what comes after mobile ... what I call "Hologram Marketing"). The underlying behavior isn't fundamentally different. However, the marketing used to drive the behavior changes, significantly. In the 1990s, you had no choice but to market to customers to get them to do stuff (in the direct channel). Starting around 2005, customer behavior in the online world solidified enough so that purchases happened without the need for marketing - much as has been the case in retail since the dawn of time. When customers purchased online, without needing catalogs, the profitability of the catalog declined - significantly. Each square inch continued to increase in cost, but the ability of each square inch to produce sales declined. That's a recipe for disaster. Since 2007, catalog circulation is down 40%. I'd bet pages circulated are down even more, as catalog page counts continue to decrease. This brings me to retail. In retail, each square foot has the same impact on sales that each square inch has in a catalog. In catalog, when customers became trained to shop online, catalog square inches (circulation * size of catalog) declined, dramatically. In retail, it is alleged that foot traffic is down 50% in the past three years during the Christmas season (click here). I want you to spend a few minutes thinking about the repercussions of that concept. Go ahead ... I'll wait for you. Ok, welcome back. Your first question is, of course, "why haven't sales declined by 50%?" Well, either the study is flawed, or foot traffic is not highly correlated with net sales. Both are likely to be true. There are customers who go to the store to buy stuff, period. Their traffic is unaffected. There are customers who go to the store for entertainment, or to do research. Their traffic is likely to be highly impacted. Mobile is going to eat retail. Mobile is going to eat e-commerce. All will be impacted by Hologram Marketing. The challenge, of course, is "what do we do with this information"? We can say, with reasonable confidence, that omnichannel strategies won't work. Their predecessor, called "multi-channel", didn't work for Borders, or Circuit City, or CompUSA, or JCP, or Sears, or Coldwater Creek, and it certainly didn't work for catalogers. Heck, go look at Gap's comp store sales trend over the past decade --- they're down something like 20% over that time, a time when inflation is +30%. Was Gap not "multi-channel", and are they not heading toward being "omnichannel" today? How did multichannel work for them? No, you don't fix a structural change in retail by turning a store into a digital distribution center. When is the last time you heard a customer get excited about going to J. Crew because the customer might be able to get something shipped to her home from a nearby store? When is the last time you heard a customer get excited about J. Crew's merchandising and creative strategies? Hint - the latter comes up more often. Retail is all about experiences. The more we digitize it, the more we facilitate the very channel shift that buries the existing retail channel. Give this little ditty about Nordstrom closing stores in the Portland market a read, my loyal subscribers (click here). Instead of getting knee-deep in the #omnichannel weeds, let's get the plane up to a comfortable cruising altitude, and look at the Portland market from 30,000 feet in the sky. A thriving e-commerce business at Nordstrom (#digital #mobile #ecommerce). 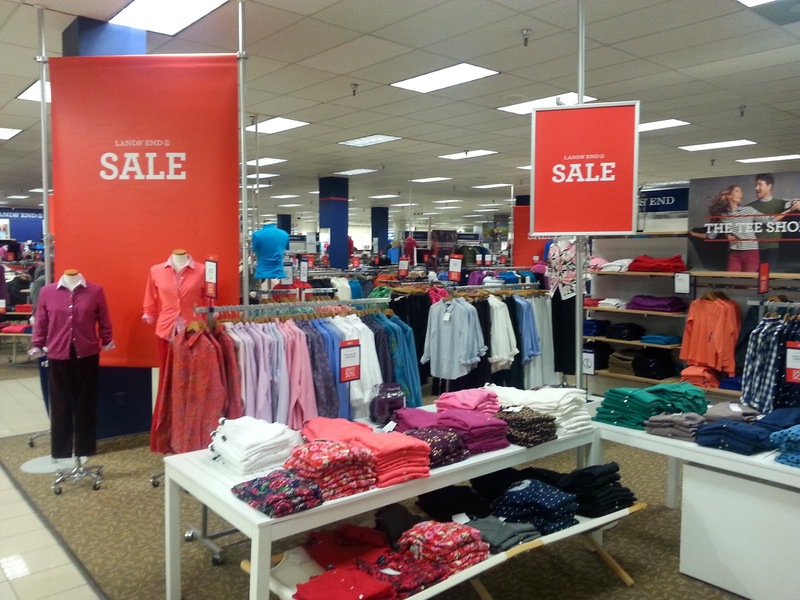 A growing Nordstrom Rack off-price business (#discounting). A shrinking full-line store presence (five down to three) (#ohboy). Current/Future renovations at the 3 full-line stores (#omnichannel). The stores that are being closed were opened in the 1960s and 1970s. The story goes beyond Portland. Full-Line full-price stores have grown from 109 in 2008 to 117 today (1.3 per year). Off-price Nordstrom Rack stores (which are not integrated with Full-Line stores or the website, dear omnichannel advocates) have grown from 60 in 2008 to 140 today (13 per year). E-commerce has grown from $700 million in 2008 to at least $1.3 billion today. What does that tell you about the future? What is growing? Online - sales growth doubled in the past five years. Low-Price - Nordstrom is increasing the Rack store count 10 times faster than the Full-Line store count, with store counts more than doubling in the past five years. Mind you, Nordstrom is a successful business. What do you think will happen to a retail business that is less successful than Nordstrom, a business that crumbles under the weight of debt when sales drop by 5%? The next ten years in retail are likely to mirror the last ten years in catalog marketing. 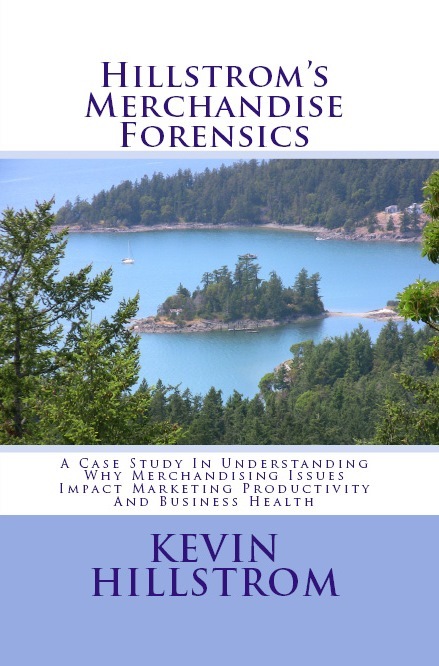 What happened in catalog marketing? We were told that catalog had to be "multi-channel", that the catalog had to be integrated into the online experience, causing both channels to fuel each other. This concept didn't work. It appealed to the "core customer", who is now 55+ and rural. Everybody else just disappeared, they walked their business over to Amazon and to large retailers who grew their own, underutilized e-commerce channels. The reduction in customer productivity caused catalogers to pull 40% of their paper-focused square inches out of the mail. Forty percent! Catalogers doubled-down on "best customers", squeezing every bit of profit out of them possible. In cataloging, the costs are "variable", which is an advantage. When the paper is pulled from the mail, it's gone - no worries, no debt, no empty floor space. What will happen in retail? We are being told that retail has to be "omni-channel", that the retail store must be digitized and fully integrated into the online/mobile experience, causing all channels to fuel each other. This won't work (my guess, I could be wrong). It probably will appeal to the "core customer", the 5% of the baby-boomer centric customer file who loves the in-store shopping experience and actually wants stores to become digital distribution centers. Everybody else (especially customers age 18-44) will focus on inventing the future. When is the last time you heard a 21 year old say "I just wish that Forever 21 would have better digital distribution centers in the malls I frequent?" Existing stores will experience productivity declines (ask Nordstrom about the two older stores in the Portland market). It doesn't matter that online and stores are working together - at all - your retail CFO is going to look at that whopping fixed cost associated with a store, and will question why it should remain open? The reduction in customer productivity will cause retailers to close older stores. The reduction in customer productivity will cause retailers to invest in "the best opportunities". These may be low-price branded concepts (i.e. Nordstrom opening a Rack store at West Town Mall in Madison, WI - a former higher-end mall that is adjusting to modern economics), these may be remodels of good locations, these may be build-outs in new concepts (new concepts are not mall-based, are they?). In other words, weak stores will disappear - while strong stores may even get stronger. Retail stores represent fixed expenses. Unlike catalogs, you cannot simply remove them from the ecosystem. When closed, they sit there, collecting dust. We're going to have a lot of closed stores, sitting there, collecting dust. In catalog, 40% of the square inches simply "went away". In retail, will 40% of the square footage "be abandoned"? What are the consequences of empty square footage on our communities? And maybe more interesting ... especially if you market to an 18-44 year old customer, what replaces a Sears when a Sears store shuts down? This will result in a fundamental transformation of retail. The baby boomer version of retail will die over the next ten years, unable to be saved by omnichannel strategies. Retail won't go away, but it is conceivable that 40% of the square footage will be "emptied", rendered useless by the impact of e-commerce on Jennifer and mobile on Jasmine. It will be interesting to see what (if anything) replaces what is lost. Think about what happened to Borders and now to Barnes and Noble - especially the latter, they did everything the omnichannel folks love to see executed, and none of it worked. None of it. When mobile impacts everything else the way Amazon (e-commerce) and Amazon Kindle (digital/mobile) impacted bookstores, use Borders / Barnes and Noble as your cautionary case study of the future of retail. I'll offer an essay a day on retail for the remainder of the week. Could write a booklet about it. Hmmmmmm. We have one question this week, and it's a good one - it comes from Charles: Your quote from last week makes a lot of sense to me ... "The future is proprietary merchandise that customers love, sold at a fair price with amazing customer service and a compelling story, yielding healthy gross margins that enable enough profit to pay employees well and allow the business to invest in the future." But how do you get the word out? What is the optimal customer acquisition strategy for 2014/2015? Sure, every brand is different and unique, but if you were launching an outerwear brand today, how would you do it? Clean slate. Look at what is communicated here. We have free ground shipping, we have a cause that customers can support, we have easy navigation (including featured products below the fold). Each of the tabs takes us to a different story. Now let's look at the other side of the coin - Amazon. Notice the difference in selling technique? More on that in a moment. First, I'm going to decide who my target audience is. Now that I know my audience, I'm going to decide where I stand on the pricing/fashion continuum. Am I fashion-centric, charging expensive prices with fat gross margins? Or am I battling everybody else in a race to see who is last to lose to Amazon? Finally, I'm going to decide on my selling "style". Do I tell a story like The North Face? Or do I use Amazon's style of selling? Of course, you can pay to get your message out there ... June / Judy / Jennifer / Jasmine / Jadyn all have channels that they prefer, so if I want to get my message out there to Jennifer, I might invest wisely in search to get my first $3,000,000 of sales in the bank. If my customer is Jasmine, I'm all over social/mobile as my way to get my first $3,000,000 in the bank. If my customer is Judy - I'm creating a catalog and I'm renting names from my competitors via co-ops like there is no tomorrow. The audience determines how I invest my money. But most importantly, my story must be worthy of word of mouth. I know, this sounds pithy, but if I'm not doing anything that is worthy of getting customer to talk, then why I am even in business? What is the story I'm going to tell? Why would my customers share my story with their friends? The storytelling aspect of marketing is seriously underrated. If I'm a reasonably new business, I need a story, a point of view, something that differentiates me from everybody else. Visit Mizzen and Main (click here). Do you see a point of view, a story, that differentiates them from everybody else? This story, this point of view, is completely missing from marketing. It's the point of view that gets people to talk about you and to share your story early in your development. That's where I'd invest the majority of my time. Ok, time for your thoughts. How would you "get the word out"? If you want to see me speak about the value of social media communities (the title of the session is "A Cold Hard Dose Of Reality), click here for more details. I will have some time available to meet with you about your projects ... I should be available the afternoon of Thursday, February 20 ... and the morning of Friday, February 21. Contact me (kevinh@minethatdata.com) for details. I know, the USPS is going to make life hard for you in the future. And I know, you put all your chips in the co-op basket, and now you don't like it that your co-op segment productivity is down 11% vs. last year and nobody in the co-op profession can explain to you why that is happening. Maybe it is time to experiment with different concepts? I'm not saying you throw away what you are doing - but might it be time to experiment? Today, I'm sharing Stitch Fix with you (click here to visit their website). You fill out a brief survey. Stitch Fix gives you five hand-picked items. You keep what you want, send back the rest. I'm continually amazed at how catalogers eschew the old-school "continuity program" business model. Granted, these startups (who aren't using catalogs, by the way) may fail, but at least they'll go down swinging while applying a new twist on the old-school continuity strategy. We can keep whining about where the catalog business model is headed. Or we can get busy inventing the future. Do we have the courage to get busy inventing the future? "How will anybody find our website without a catalog?" "The USPS is going to run us out of business." Well, if you've trained a 55+ year old customer for thirty consecutive years to only respond when a catalog is sent, then, well, yes, you're stuck with an ever-decreasing level of marketing productivity. Here's one for you - Frank and Oak (click here please). It's mens apparel - online - that's not an easy category to make hay in, is it? They don't use catalogs - but they do promote their story via magazines (click here). Did you notice? They have 1.1 million registered users. When you visit for the first time, you'll give your email address (catalogers, do you demand this after paying the co-ops a fortune to drive traffic to your site), you'll list your merchandising preferences, and then you're on your way with a customized merchandise offering (catalogers, do you personalize your home page based on a quick survey filled out by your customers). The company is two years old. 1.1 million registered users. Two years old. The company ships 35,000 orders a month ... if we assume a $100 AOV, that's nearly $40,000,000 a year ... if we assume a $150 AOV, that's nearly $60,000,000 a year. Again, two years old, folks. Did your co-op add $40,000,000 in annual sales to your business in the past two years? By the way, when you're filling out their survey, they ask for your age range. They lump everybody age 41+ into one bucket. This tells you something, don't you think? We need to shop whining. We complain that our $50,000,000 business might deal with jacked-up levels of postage costs, putting us out of business. No, we're putting ourselves out of business. Old, stale merchandise, targeted to baby boomers. New companies are born, without catalogs, with magazines only circulating to 50,000ish folks a few times a year - they capture data up-front (email address and user preferences), they offer a personalized assortment. We're whining about the wrong issues. We can build a business without a catalog. We can build a big business without a catalog (ask Amazon). Maybe, just maybe, we all have to change. For instance, it is very common to observe businesses that stopped investing in new products, coming out of the recession around 2010. I get it, I do. The world was coming to an end, and you didn't want to invest, you wanted to conserve cash. This is what I see - all the time. We're doing this to ourselves. 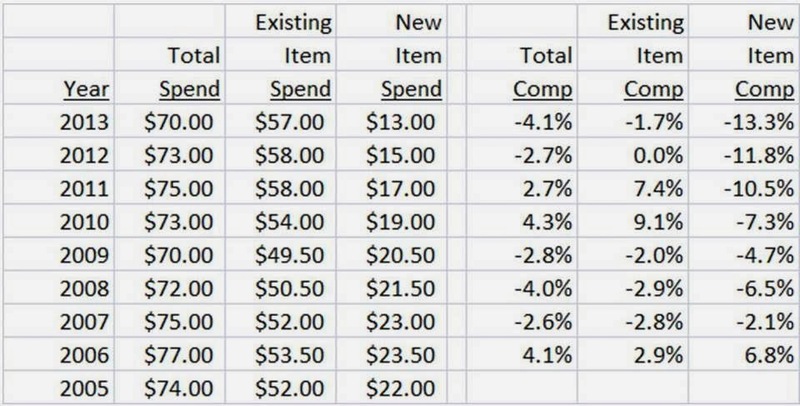 Look at the "New Item Spend" column. Comp customers really started tanking on new items, beginning in 2010. New item spend dropped from $20.50 to $19 to $17 to $15 to $13. For a period of time, the drop in new item productivity was offset by existing items ... as the businesses offered fewer and fewer new items, customers shifted more and more into existing items, driving up existing item productivity. On the surface, Management sees this as a good thing. "Our best items continue to carry the business, we need to focus on them". So Management cuts back even further on new items. That strategy works until existing items outlive their usefulness, which always happens. Always. It's the law of merchandising, it is unavoidable. At that point, what are the new items that replace existing items? Oh, there aren't any! This is when productivity begins to tank. This business, featured above, is on the verge of collapse - you just can't see it yet if you look at normal business metrics. You can see it if you run a merchandising forensics analysis. You run the comp segment analysis, and you count the number of new items that generate at least "$x" in the first year (I usually pick a 45th to 55th percentile for all items as the cutoff). 2013 = 174 new items. 2012 = 196 new items. 2011 = 219 new items. 2010 = 233 new items. 2009 = 241 new items. 2008 = 254 new items. 2007 = 266 new items. 2006 = 255 new items. 2005 = 250 new items. Yup, we've got a collapse in new items, which yields a collapse in new item productivity, which yields a customer switch to existing items, items that eventually outlive their usefulness, yielding a business that is about to collapse. And we're doing it to ourselves. Price matching works in a world where the potato chips cost $2.39 a bag and somebody down the street has them for $2.29 a bag. You're higher, but it's an issue of being off by 4%. Last month, my printer died. I called the manufacturer, it's not under warranty, and they won't send a new printer head because it essentially costs the same amount as the printer. So it's time for a new printer. The printer manufacturer offers a refurbished model for $188 - they're price matching, heck, they're beating the price. Good! I guess it's good, because it is refurbished. Then a little research suggests that the refurbished model is slightly, and I mean just slightly different. Oh oh. So I head out to Amazon ... where the slightly different model sells for $117. So I tell the poor guy on the phone about this little issue - he visits Amazon, notices that the unit is $117, and offers to match the price. Of course, he tells me that free ground shipping will take 9 days - which is funny, because I tell him that Amazon will get it here for me in two days for free - at which time he tells me he can get me the item in two days for $40. Ok, I'll go with ground shipping - but only because he's giving me a two year warranty and on Amazon I only get a one year warranty. Except that this isn't wonderful. I can't tell you how often I'm asked why customers won't "convert" on the web. "Maybe we haven't optimized our site properly?" And all sorts of vendors and consultants and trade journalist will beat the living daylights out of you for not optimizing your site properly. You're stupid - just ask them! But that's not the issue. Honest and fair pricing, that's the issue. The internet, and even more these days with mobile, is pushing pricing into three tiers - but you already know this. Tier #1: The lowest possible price with the fastest possible service (Amazon). Tier #2: Profit generated from uninformed customers. Tier #3: A "branded" experience that the customer is willing to pay a premium for. That's it - take your pick. The vast majority of customers can't afford anything but the lowest possible price with the fastest possible service (Amazon), and let's be honest, that's a pretty good deal for the customer - not a good deal for the American worker, but that's a topic for another day. The maker of the printer falls into Tier #2. This printer is #omnichannel - selling on Amazon and generating almost no profit there - selling on their website and over-charging uninformed customers. Of course, this strategy works in the short-term. Once the customer is burned a couple of times, that all changes. Most of the businesses I work with are trapped in Tier #2. Tier #3 is our future, mastered by folks like Apple, or Nike, folks who get you to pay more for items - items that you can get similarly but not the same elsewhere. It's easy to try to be in Tier #1 but almost impossible to win. It's painful to be in Tier #2. It leads to games like "We'll Match Their Price", which, in reality, means "we'll rip off uninformed customers so we can stay in business". It's very hard to try to be in Tier #3. But long-term, it may be the only choice. As is now our tradition, your questions, real and simulated, are answered every Monday. Email your question to kevinh@minethatdata.com. Our question comes from Ruth: You are focused on catalogs too much the past two weeks. Why? And honestly, the stuff you are talking about is ten years down the road, we need help now. Why not provide us with free tactics that help us today? There are three reasons I'm trying to focus the majority of my audience on what matters. First, read this press release from Harte Hanks (click here please). Here's the important quote ... "The decline in revenue was primarily driven by a 13.6% decline in our Retail verticals due to clients making mail format changes." Here's the second reason - this article (click here), which outlines that jobs in the print industry have shrunk by one million (yes, one whopping million) in the past seven years. UPDATE - The DMA pulled this article down from their site the morning of 2/10/2014. And the third reason - this article (click here) showing that the number of catalogs mailed is down 40% in the past seven years. Yes, 40%. Sometimes, we need overwhelming evidence before we bother to think about what is happening. What is happening is that you can mail catalogs - you'll be able to do so for decades at ever decreasing levels of circulation. More important, what is happening is that the catalog business model is ending. These are two very, very different concepts, concepts that folks have a very difficult time grasping simultaneously. Now, I get it. There are a ton of folks out there, about 55 years old. They made it to the Executive level, and they enjoying pulling down $200,000 or $300,000 per year. They're thinking about how to get to age 62, not how to protect a business long-term. If you are in that camp, then yes, by all means, milk your quarterly results for all they are worth, you aren't an audience that thinks strategically, you aren't thinking about protecting the future for the employees you supervise. Go enjoy a healthy dose of omnichannel strategy. There's another large faction of readership - the vendor community, consultants, and trade journalist. These folks have good intentions, no doubt. But their loyalties lie with their bottom line, not with your bottom line. Pretend you are Harte Hanks - your print-focused business plummeted by more than 13% last quarter. You look at the numbers, you know that the core of your business (print support) is dying. Strategically, you're going to attack your clients on two fronts. First, you're going to convince your clients that "print is in the mix". You'll convince your clients that catalogs are a vibrant part of an "omnichannel" strategy. You say this, of course, to keep the dollars flowing today, so that you can stay in business. Second, and more importantly, behind the scenes, you're looking for a path to the future. You are using client revenue today to fund your quest to find a path to the future. That path to the future, folks, does not include print. Go ask the co-ops who are linking social/mobile data to catalog purchases, go ask your printer who invests in iPad apps that enable catalog shopping at the swipe of a finger. These are not print-based solutions. Your vendor partners are investing the money you give them today (money earned from print-centric solutions) for future solutions that are not print-centric. This brings me to you. You can see the writing on the wall. You don't believe in omnichannel nonsense (for if omnichannel worked, omnichannel businesses would be growing by 5% or 10% a year, across the board - and print-based businesses would have crushed Amazon, driving Amazon into bankruptcy). You realize that social is 0.8% of your sales total, and it isn't your fault that the percentage isn't higher. You realize that mobile is the future, that mobile will eat e-commerce, and that your customer is likely too old to embrace mobile. You realize the dilly of a pickle your business is in. You are the person I am writing for. You might be 26 years old, you might be 62 years old, it doesn't matter. I'm asking you to put your business on a long-term path to success. I'm asking you to focus on the future. The future is proprietary merchandise that customers love, sold at a fair price with amazing customer service and a compelling story, yielding healthy gross margins that enable enough profit to pay employees well and allow the business to invest in the future. Notice what I just said. Notice that channels are not part of that. Our focus on channels takes us away from focusing on the paragraph above. I speak with marketers who can't even identify the best selling items. Come on!! It's going to get harder and harder to listen to your vendor partners. They have to promote an omnichannel message that includes print, because it guarantees their short-term success. You will slowly remove contacts from your strategy, you will slowly cut circulation depth, and you will slowly reduce page counts. All of this goes against the messages you will hear from your vendor partners. I'm on your side. I'm "pro you". If I wasn't on your side, I wouldn't sell the very methodology that allows me to make a living for just $29 (click here - Hillstrom's Contact Strategy). I'm literally giving away my way of making a living. Do your vendor partners do that? If I wasn't on your side, I wouldn't sell the very methodology that allows me to identify why a business is struggling (click here - Hillstrom's Merchandise Forensics). Do your vendors give away all their secrets for $11.95, or do they keep finding ways to force you to mail expensive catalogs? This is the end of my two-week catalog rant. I hope you give some thought to the future of your business. The catalog business model is coming to an end, even though you'll be able to mail catalogs (at ever-decreasing levels of circulation) for another one or two decades. The sooner we accept our reality, the sooner we get down to the basics of building a sustainable, healthy business for the long term. When is the last time you said to yourself, "geez, I wish I could just link my cell phone to my home phone, so all my calls could come through my land line?". The past decade has been all about technology. Technology is pulling us in one direction. History, however, tries to pull us back to the past. There are so many folks who have a vested interest in protecting history. Jobs count on preserving history. In this case, Panasonic has a vested interest in protecting history. Panasonic must find a way to link a 1994-style phone and answering machine to a 2014 smart phone. So they devise a solution to route your smart phone through old-school technology. We can look at an example like this land line phone, and easily understand that it is not likely to succeed, long-term. Our unbiased perspective allows us to see the future. But when we look at catalogs, our perspective changes. Now we're biased, and this bias causes us to see things differently. 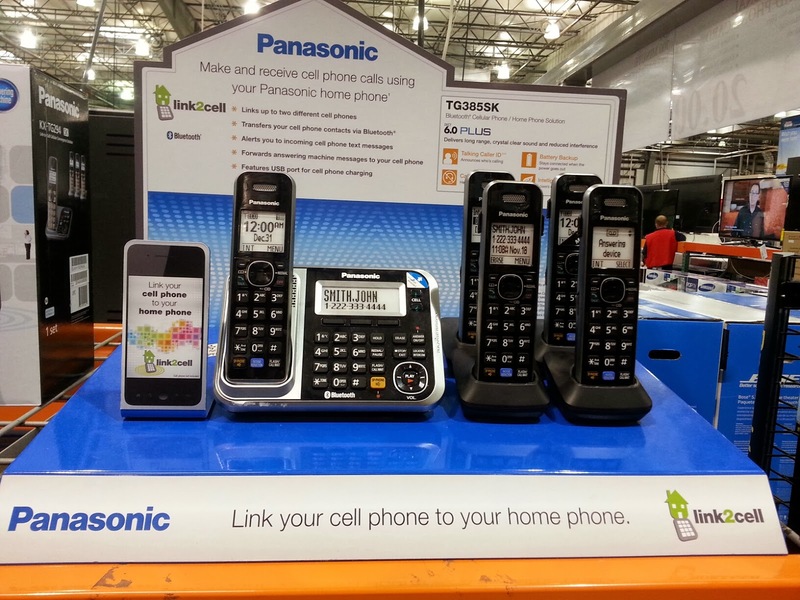 In catalog marketing, we do the same thing that Panasonic does with a land-line phone. The exact same thing. I'm sure Panasonic sees that sales of their answering machines are on the decline, just like catalogers know that catalogs mailed are down 40% since 2007 (click here). Panasonic responds by linking the past to the future. Catalogers respond by linking catalogs to the future - calling it "omnichannel". Trend #1 = The catalog business model is ending. Trend #2 = The catalog as an advertising vehicle within an omnichannel framework. Too few people understand the distinction, causing a whole bunch of pointless static about how catalogs are either dead or vibrant. Trend #1: The catalog business model is ending. In the catalog business model, paper came first. You assorted your catalog, then, you put the merchandise online when the catalog dropped. You integrated prices, promotions, and creative. You rented your own list out to others, you rented names from your closest competitors. You paid co-ops for an endless supply of just-below-average prospects. You spent 30% of your annual net sales on printing/paper/postage. Everything in the company was organized to support the catalog. This business model is ending. The productivity (getting worse), gross margins (discounts & promotions erode margin), and costs (USPS) dictate that circulation will shrink in perpetuity - it's already down 40% over the past seven years! Because catalogers focused on "core customers", the merchandise assortment did not evolve. Today, the merchandise offered in catalogs is preferred by "older" customers. Because the merchandise appeals to "older" customers, when co-ops execute their models, they find "older" customers who like merchandise preferred by "older" customers. As a result, catalogers continually acquire new customers who are "older". Because younger customers are not part of this loop, younger customers do not have a preference for catalogs, and will not have a preference for catalogs. Worse, when mailed a catalog, they do not respond, driving down catalog productivity. Everybody, and I mean EVERYBODY associated with catalogs (including the vendor community) knows this is happening. Nobody will talk about it, because the consequences are frightening. Trend #2: The catalog as an advertising vehicle within an omnichannel framework. If you are a vendor, and your livelihood is based on the heritage of catalog marketing, and you know that the catalog business model is ending, then you are frightened. If you are frightened, and do not have a path to the future (see Panasonic above), you must connect the past to today in order to stay relevant. The way you connect the past to today is called "omnichannel". In retail, omnichannel theory suggests you align all stores around digital strategies, offering customers what they want, where they want it. In catalog, omnichannel theory suggests that catalogs (not the catalog business model, but the mailing of a catalog as a piece of advertising) are an integral part of a suite of advertising tools (catalog, email, search, affiliates, banners, retargeting, cart abandonment, mobile, Facebook, Twitter, Instagram, Pinterest, Vine, countless others) that, when evaluated as a sum total, cause customers to buy stuff. By promoting the theory that catalogs are part of this mix, vendors are betting that their customers (not real customers, but actual catalogers) will continue to put catalogs in the mail. By continuing to put catalogs in the mail, vendors assure their short-term viability, while searching for a path to the future (this is like Panasonic creating a land-line phone that connects to a mobile device, buying Panasonic time to iterate to the future). As a result, vendors and consultants and trade journalists, all dependent upon you (the cataloger) for their short-term financial success, find a way (omnichannel) to keep you mailing catalogs, so they can continue to stay in business. Omichannel is not real. It is an astroturfed concept used by vendors, consultants, and trade journalists, to keep you executing historical channels in an effort to keep vendors, consultants, and trade journalists financially viable. Customers using multiple channels to shop - that's real, and not fundamentally different than ten years ago, when customers used multiple channels to shop but we couldn't track it or measure it easily. Almost everything you read about catalog marketing is a theory that enables the publisher of content to do what Panasonic is doing above - trying to keep you with one foot in the past, so that the vendor / consultant / trade journalist can stay in business today. All of the noise is around issue #2. All of our time should be spent focusing on issue #1. Ask a former employee of Mokrynski or Millard about issue #1. We will continue to circulate less and less - fewer contacts, fewer pages per contact. We will engineer the catalog down to a postcard over the next decade - economics and customer productivity dictate this to be the case. That will be the 30,000 foot level trend. At the 30 foot level, there will always be a subset of customers who love catalogs - this subset will cause vendors / consultants / trade journalists to use this subset as a case to market to the whole. Issue #1 should cause us to ask ourselves a series of questions. As productivity declines and costs increase, circulation will decrease. How will we maintain sales increases in an environment when the primary marketing vehicle is slowly being eliminated? Is the most important element of our brand the merchandise we sell, the service we offer, the price the merchandise is sold at, or the catalog? If the answer is "the catalog", what does it mean to our "brand" when the catalog is de-emphasized over time? Who are the business partners who are willing to give us an unbiased and fair evaluation of our business, even if it means that the business partner eventually loses money because of it? How do we staff our business if as many as 25% or 30% of our employees are dedicated to producing paper-based content that will not exist in the future at the same rate as today? How do we tell our "customer of the future" that we have something new to offer? When the current customer (age 55 - 64) retires and stops buying from our business, can we count on a younger customer (currently age 45 - 54) to buy what we sell? In other words, will younger customers move into our product assortment, or are we following a customer cohort into retirement? In the future, proprietary merchandise, service, price, and story are going to be critically important, independent of a catalog. How are we going to integrate these key concepts independent of a catalog? Most assuredly, the answer to our questions is to not replicate what Panasonic did with their land-based phone. Most likely, vendors / consultants / trade journalists will encourage us to do what Panasonic did.